Complex electronic systems for artificially varying acoustics are now used in many auditoria. In some cases, these present the best way of meeting the different acoustic requirements of multi-purpose halls. Such systems typically use a very large number of loudspeakers all around the auditorium and all operating at very low sound levels. 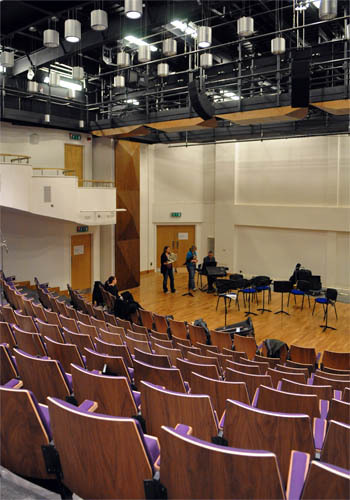 As well as providing variation in reverberation time these also provide individual reflections to increase the impression of spaciousness and lateral energy that would arise in a conventional rectangular concert hall. Electro-acoustic systems can also be linked to the stage sound system to provide surround-sound for cinema and special effects, and to “lift” sound levels for less strong speakers without the problems normally associated with traditional public address systems. We have unique experience of such systems and can advise on their selection, specification, installation and day-to-day use. We can also provide consultancy in the specification, design and commissioning of sound systems for public address, music amplification and speech reinforcement.